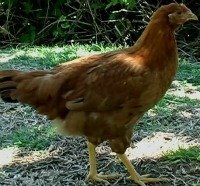 The Nankin chicken breed is a Bantam only breed. These birds are extremely rare, very pretty, and very personable. Size: Male: 24 oz. Female: 22 oz. Comb, Wattles & Earlobes: There are two varieties based on comb. Single Comb: The comb is bright red and medium to moderately large. It has five distinct points that all stand upright. Rose Comb: The rose comb is bright red and medium size in males and small in females. It sits square in the front of the head and ends in a well developed spike. Color: The beak is horn with a dark shading on the upper mandible. The eyes are reddish bay and the shanks and toes are bluish slate, possibly with a pink stripe on the outside of the shank. The plumage is primarily shades of orangey red to chestnut to golden buff and is darker, deeper, and more lustrous in males than females. The tail is black. Special Qualities: The bird is extremely rare, pretty, and very personable. It is a true bantam breed with no standard. The Nankin is a true bantam and is considered to be one of the most ancient of all bantam breeds. They were first imported to the United States and Britain in the 1700's. During this time in Britain they were extremely popular and were used in the development of the Sebright breed. They are now very rare in both the U.S. and Britain. These birds are very active and talkative. They are friendly and usually pretty slow to mature. They are fliers, but can tolerate confinement. When given access to free range they normally stay close to the coop and do not tend to wander. They do not do well in cold and if kept in areas that have cold winters will require a tightly built and insulated coop. The hens lay small white eggs, go broody, and are excellent protective mothers. They are such broody birds that they historically have been used to set for game birds such as partridges, quail, and pheasant. This trait is probably one of the things that have kept the breed from going extinct over the years. They are recognized by the ABA.